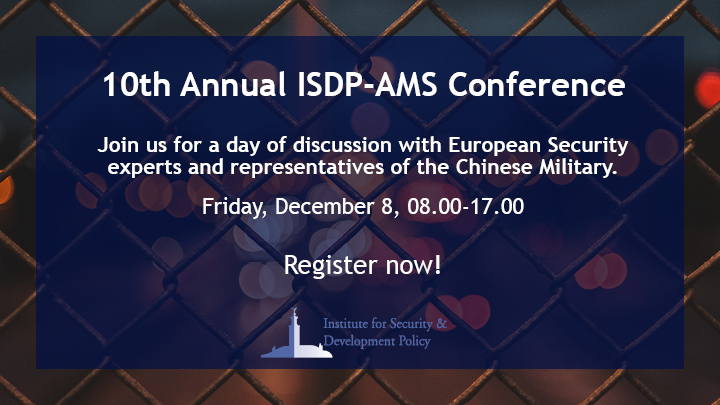 The Institute for Security & Development Policy and the People’s Liberation Army’s Academy for Military Science invite you to attend the 10th Annual ISDP-AMS Conference, which this year will cover an array of topics relevant to current trends in Chinese and European security. The PLA Academy of Military Science is a center for military studies and the premier military research organization of the PLA. AMS carries out fundamental research on military science and important issues in defense and armed forces development, drafts and modifies military doctrines, regulations and laws, and provides strategic advice and consultation for military policymakers. Since 2008, ISDP and AMS have cooperated on various multilateral issues pertaining to defense and foreign policy. The tenth conference will revisit previous conference topics such as conflict management, joint military exercises and terrorism in a contemporary context. Don’t miss this rare opportunity to meet and interact with representatives of the Chinese military, together with European security experts.